Chocolate Chip Archives | Food blog! The newest blue bell flavors out for rotation in February are listed below! Spring is coming and people are getting ready to splurge in their favorite dessert flavors! One of the most popular flavors is the vanilla, which is always available, however, they make all kinds of different varieties that will suite any taste bud! 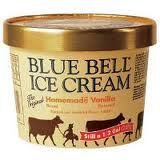 What is your favorite type of Blue Bell ice cream?